Montrose have announced that they have parted company with manager Stuart Garden "by mutual consent". Saturday's 4-0 defeat by League Two leaders Peterhead ensured that Garden's side would be unable to reach the promotion play-offs. 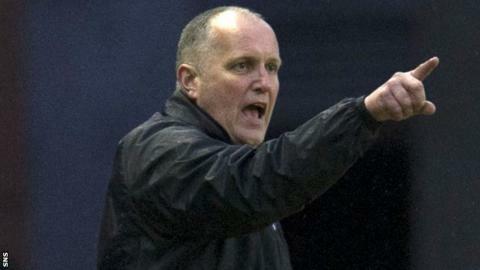 The 42-year-old former Brechin, Forfar and Notts County goalkeeper has been in charge at Links Park since May 2012. His side finished sixth last season and this term lie eighth, nine points adrift of fourth-placed Stirling. Montrose announced on their official Facebook page that assistant manager George Shields and goalkeeping coach John McCafferty would take interim control. "The club will be seeking a new manager or player manager with suitable coaching qualifications whilst in the interim George Shields and John McCafferty will be responsible for coaching and team selection," said the Gable Endies' statement. Shields, a former player with Dundee, Arbroath and Forfar Athletic, has previously managed junior side Dundee Violet and is also head of youth development at Links Park.